Olek hand-crocheted a long chain of balloons to create the new exhibit "Synthetic Nature." LOWER EAST SIDE — Yarn isn't the only thing Olek can crochet. The Polish-born artist — known for "yarn-bombing" New York icons like the Astor Place cube and the Wall Street bull — picked an even more eye-catching medium for her latest show: thousands of brightly colored balloons. 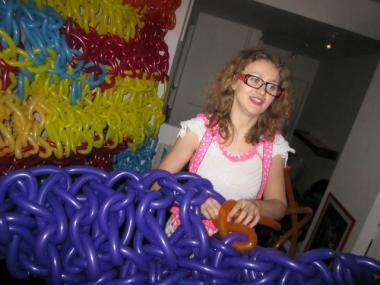 To create the artwork, which went on display Thursday night at the Lower East Side's Krause Gallery, Olek strung long, cylindrical balloons together until they formed an unwieldy thread, and then looped them into a flexible fabric. Olek — real name Agata Oleksiak — then sculpted the fabric to build a cave made entirely of balloons within the gallery, where she is working to create an otherworldly space including balloon-covered performers and machines that create balloons. 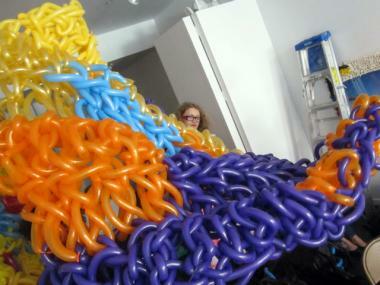 Balloons quickly filled the Lower East Side's Krause Gallery for Olek's new installation. Balloons are one of the most difficult materials Olek has ever worked with — because of their propensity to pop at inopportune moments — but that's also also why she likes them. "I love the ephemeral aspect of the material itself," Olek said. "The installation will cease to exist after a time." The bright, buoyant nature of balloons recalls the happiest moments in life — which are often just as impermanent, Olek said. As Olek and a team of volunteers hurried to assemble the show during a 10-hour marathon session Wednesday, a balloon seemed to pop every few minutes. Bu the artist was unfazed. Her deft fingers quickly found the compromised spot in her fabric, and she filled the gap by looping a fresh balloon into place before the entire creation could unravel. The show, called "Synthetic Nature," also features photos of other artwork Olek has done using balloons, including costumes made of woven deflated balloons. Even with all the balloons in place, Olek said one piece of her show was still missing. "I need an audience to come in," she said, "and be part of my work." "Synthetic Nature" opened March 15 at the Krause Gallery, 149 Orchard St. The show runs through April 10 and is open Wednesday to Sunday, from noon to 6 p.m.